I really appreciate this community and the help and support you give one another. I am on a puppy quest. As most of you know my beloved dog Gracie died over a year ago. I didn’t think I would ever get another dog, but I miss a furry companion and have started the hunt. Many of you know Gracie was a great dog, very attached to me but not so good with other people, especially when I was not present. It was difficult to leave her with friends or relatives because she would become so reclusive and depressed. For that reason I’m looking for a puppy that can be socialized to my entire family so that when I need to travel, they can watch her and she is happy. So if you know of a reputable breeder of miniature Goldendoodles, that’s what I’m looking for. I’d sure appreciate a breeder name/recommendation. Searching for one is like trying to adopt a baby. A pretty involved process and not many readily available. This Week’s Question: My husband says that he is put into a kind of uncontrollable rage when I disrespect him because it is his God-given right as the husband to be respected. Last night I told my husband, who has physically struck me in the past, that I felt unsafe in our marriage and that I thought it was necessary that we lay some ground rules and boundaries specifically to be enforced during our times of arguing and fighting so that we can keep each other accountable. He resisted in agreeing boundaries were the issue but finally agreed. I told him that a universal boundary should be absolutely no physical striking or threats of physically or hurting of any kind toward one another. To that he said that his boundary equivalent to that was “no disrespect/raising my voice to him.” He said that when he is disrespected, he feels he is being verbally abused by me and it feels as terrible as I feel when he slaps me on the arm/leg/head. In theory, this sounds “right.” He says that I am making a double standard when I put a boundary on his behavior but that he cannot on me. And yet, something does not seem right at all about what he is saying. I agree that disrespecting your husband is as sinful as physically striking your spouse in anger. Is it biblical to see these exactly the same in terms of setting “off limit” boundaries in disagreements? Answer: Your struggle to think clearly in this muddle is common to women who live with abusive men. I want to help clarify some important truths. First, the sin may be the same, but the consequences are not. His sin of hitting you is not just sinful, it’s illegal. Second, your husband’s rage and subsequent acts of violence toward you are not uncontrollable. He has total control and limits himself right now to certain levels of physical violence (that he feels are acceptable). His behavior is always his choice. In addition, I’m sure he has experienced disrespect from other people in his life – his employer, a rude driver, your children, a friend, or an enemy. People sin against us all the time in many ways and sometimes we do get angry. However, that doesn’t mean we hit them. In fact, isn’t that what we teach our children NOT to do when someone takes their toy or makes them mad? We don’t hit people when we’re mad. Period! Let me ask you a question. 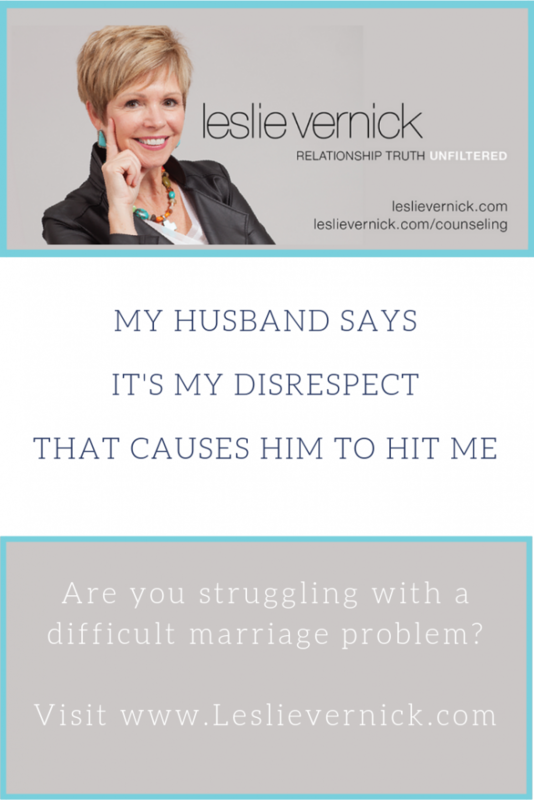 Does your husband hit other people when he feels disrespected? What do you imagine a police officer would say if your husband used that as his excuse when he hit someone who disrespected him in traffic or at the mall? Your husband feels entitled to hit you when he is mad and you have chosen not to initiate legal consequences that would protect you from this kind of abusive behavior. Third, your husband says that it is his God-given right to be respected. Does he also believe that it is your God-given right to be safe, feel loved, and cherished in your marriage? Therefore, when he fails to love and cherish you and you feel hurt or angry, would it be okay with him if you hit him? The truth is, no spouse can always give us what we want even if what we want is a good and godly thing. Hurt and disappointment occur in every marriage. But is abusive behavior or speech an appropriate response to our disappointment and anger when our spouse fails to give us what we want? Jesus says “Never!” The Bible labels that kind of behavior as sin and is never justified. Your husband’s entitlement thinking has deceived him into believing that since he’s entitled to be respected, he’s entitled to hit you when you’re not complying with what he wants. That is not true. Does that mean that when you feel strongly about something or disagree, you can’t speak with an elevated voice without him feeling disrespected? Does that mean that you cannot argue because he will feel you don’t respect his opinion? Does that mean you have to agree with everything he thinks because not to will feel disrespectful to him? Ask him to define or describe for you the behavior you do that feels disrespectful to him. Is it calling him names? Is it swearing at him? Is it rolling your eyes? If you know what it is specifically, then you can decide whether or not you can agree to stop or change it. If you don’t know what it is, then it’s much harder to stop disrespecting him (in his eyes). Finally, in order to live together in a safe way, you both need to agree when either one of you feels unsafe, the one who feels unsafe can call a time out. That means you stop the conversation, until such time self-control and healthy conversation or conflict can occur. It’s important for you to realize those seemingly lesser violent incidents like pushing or hitting often escalate in intensity and frequency over time to more dangerous levels. I’m concerned about your long term safety as well what it says to your children who see their father justify and excuse his treatment of their mother by hitting her and then blaming her. Over time that pattern can lead to your children doing the same; blaming you and acting abusively towards you when they feel frustrated or angry with you. They also may very well end up blaming you for “ruining the family” when you’ve had enough of his abuse and want to separate or end the marriage. Friends, how do you wade through the confusion of blame-shifting when someone blames you for their bad feelings or sinful actions? This is an excellent reply to a very important topic. Not just the physical part of abuse but the mindset that is revealed in the writer AND her husband. The fact that she is ‘even’ negotiating with her husband indicates dangerous destructive cycles that she might be in denial of or needing serious intervention about her rationalization over the abuse she is currently in. The mindset of the husband is also important to see as you pointed out about his possible definition of disrespect. SO KEY! My husband had and sometimes struggles with this area of defining disrespect. While he has never been technically used physical action to harm and hurt he has been emotionally and verbally destructive- with the capacity of blame shifting to an expert level. My husband used to define my difference of opinion as disrespect, or if I had any issue to be resolved. Many things were feelings of disrespect if he wasn’t getting back the mirror he was looking for. It took ALOT of intervention for him to rewire his mindset on how he defined disrespect. This was one root of many that created a lot of problems in our marriage. This blame shifting is really saying I will not take personal responsibility for my behavior. 3. Draw near Jesus like never before,detach emotionally from your resistant abuser – May need to physically separate. 4. Get Support group 2-3 people at min. 5. Educate yourself as if you are having to climb Mt Everest. Lundy Bancroft is a good resource. 6. If possible depending on your own recovery – Invite the offender into recovery and see what their choice is by action only not their words. One must keep a fact journal. Facts are critical even if the abuser doesn’t want to acknowledge anything or entertain a conversation- trust me often they won’t and if they do it will blow to again WW3. Writer your attempts at educating your husband and giving ground rules about physical abuse is concerning because you are not speaking to a 2 yr old. Does he sit down with you and tell ‘you not to hit him’ when you don’t feel cared for or when you feel hurt or disagree with him? I would assume that this doesn’t go the other way. It isn’t just his physical actions that are deeply scary but his mindset is far more problematic. He needs interventions!!! Writer- this husband you are married to is currently missing ‘critical marriage material’ to be in place where the Lord can be glorified. As a Christian, your covenant and ambassadorship is with the Lord first and for-most. You are a daughter of the King and hopefully that will help you seek detachment so things won’t continue to get foggy for you. Early on in the discovery of my husbands destructive MINDSET it was also disrespectful to him if I had ‘needs’ that were not his own or needs he could not relate to. He saw me needing something different or needing something from him that didn’t come natural as disrespectful. Aly and others, I am late stepping in here because somehow my name got dropped and I didn’t see this earlier. I’ve missed you all! I think that your point about defining what he calls disrespectful is important. The writer needs to “sweep her own side of the street” here, to be sure that her behavior is God-honoring. It’s one thing to have a different opinion from his, if that’s what he calls disrespectful, but it’s another matter entirely how she expresses that opinion. If, when she expresses it in a calm and respectful way, he still gets angry, then that’s on him. But she needs to be very careful how she expresses herself so that she isn’t really agitating him. As Leslie said, eye rolling and name calling are definitely not respectful behaviors. I so agree with this Aly, and it reminds me regretfully (but needfully) of the ways I expressed myself to my husband’s verbal attacks and other things (self-defensiveness, nasty comments about his work ethic, and other things ) : …it clouds the waters and has me going into thoughts of “if I had only been like this rather than that” – though I still know the abuse was not right either way. I just had SUCH a hard time with disappointment, resentment, and similar that is FELT nearly impossible to respond in love. I wish I had all of the time! ( : Thank you! I wish someone told me this when I was married. When an addict or a family member that supports the addict make a claim about me or refuse to hear my story, explaining myself just does not work because of how our brain is wired. I am a therapist and do a lot of work with points of resistance and cognitive dissonance. I am currently reading a huge dissertation on dissonance because we work with a lot of resistant addicts. Turns out that our brains are wired to literally “maintain itself against he intrusion of new and potentially upsetting information.” What this means is that no angel and no amount of evidence can change the minds of someone tat has decided to protect their current belief system UNLESS they choose to challenge that by going to therapy and getting an experiential therapist (still reading the dissertation). I suffered so much from trying to explain myself and repeating myself and gathering evidence so I can once and for all prove tat my exhusband was abusive. Well, his parents never did see all the mounts of evidence. Through my personal recovery work I learned to allow them to have their own reality as I know what real reality was. Now, I feel like I further understand (and feel validated) that they are literally not capable of seeing evidence. Maybe this does not help anyone but knowing the science behind it helped me. This really helped me a lot. Thank you for sharing. My husband blames me for our 13 year marriage ending (I had an affair 6 years ago) However I finally decided to get a divorce because of his emotional and psychological abuse towards me and our two young daughters. It just dawned on me that his ” brain is wired to literally “maintain itself against the intrusion of new and potentially upsetting information.” namely that his behaviour was the cause of me leaving our marriage so instead he convinced himself that we are getting a divorce because of my affair that happened 6 years ago! Yes Olga and he will deny taking responsibility for his actions and often play the victim when caught too. Have you done some research about Narcissism? Hello. Olga had the affair, not her husband. But it sounds like perhaps Olga asked forgiveness for (?) the affair…etc., and that MORE RECENTLY she has been hurt by ongoing emotional and psychological abuse from her husband (who is supposed to protect and…). And even if he were to say that this was the result of her affair (giving himself justification for the abuse – though Olga did not say what the abuse was, I’m sure she is probably mature enough to know that it was abuse? ), it in fact does not give him an excuse by any stretch of the imagination to defile his role as husband (protect…cherish…) and daily(?) cut his wife down (do you all realize this is ongoing damage to one’s soul?!?!?!). One can take only so much, and it is NEVER justified no matter what one has done or does (I think that is an ongoing theme in all of these conversations). God bless you all – very much! Sounds like some blame shifting and justification is going on in your mind. It is never okay to have an affair. You had lots of options and a betrayed spouse has a biblical right to divorce you and marry someone else. Time has nothing to do with it. When you break that sacred trust you have destroyed something precious. It may take him 6 or more years to heal, see clearly whether you are truly repentant and broken and make a decision. Your minimization of the harm you did, blame, and bitter tone tells me you are not sorrowful at all. You could instead be thankful that he gave you any time at all to show him you have taken full responsibility and had a heart change. Not sure what you mean Carolyn as there was no affair in this question. The husband is clearly blameshifting his own anger issues onto his wife, and she never said she had an affair. But even if she or he had an affair in while in the marriage, abusive behavior is not justified or excusable. Nor is an affair. So when these breaches in marital trust comes up, they must be dealt with in a wise and Biblical way or the marriage relationship stays broken. I think Carolyn was talking to Olga, not the original question writer. To what Connie said above – oh my gosh! It helps me tremendously in helping understand many held-onto mindsets in this situation. I have in the past looked into cognitive dissonance (not in this particular context however) and find it fascinating. I now find it even more fascinating in how it may apply in my own relationship situation – for all parties, probably even myself! God bless. Connie,I’m reminded of the passage in Romans 1 about fools suppressing the truth…and God gives them what their deceitful hearts desire.It sounds like science is backing up the fact that the longer you deny truth and live in your own reality,the harder it is to recognize and receive truth when it is presented to you.I believe the Bible teaches this.We don’t know when people reach this so we are called to pray for sight for the (spiritually)blind and leave them in Gods hands.This is where I am with my husband after almost 6 months of separation. Fear keeps people trapped in cages of denial,but God only dwells in truth because He is the truth and He removes the scales from our eyes as we humbly submit to Him.I like how you put it” allow them to have their own reality”.I think this is exactly what Jesus did when people turned away from Him,he allowed them to choose to walk away. Wow Janice. I love this! I love when folks relate all of this back to something in God’s Word (truth) – and this is incredibly insightful! I just could not understand why my husband couldn’t seem to see certain things (which resulted often in blame-shifting), and so this is helping me a lot. I am praying too during this time of separation. But sometimes it seems that certain things are just so deeply ingrained (and for so long) that nothing apart from a miracle will free him from them (and thus I will continue to be most of the problem…). And at this point, I’m not sure how much a part of this I am supposed to be even though I know God hates divorce (that is NOT what I want; I would love the miracle – and in me too). The real disrespect is his physical abuse of you – usually the claim of disrespect is a smokescreen for the truth. I have seen someone with stolen merchandise under their jacket claim the store clerk was disrespecting them! I love Leslie’s quote that part of growing up is learning how to handle ourselves when we are disappointed, angry, and hurt when we don’t get what we want. Thanks Leslie for speaking truth to help clear the fog! I think the last thing in the world you are doing is disrespecting your spouse, on the contrary, you are respecting someone who should not be respected at all! It blows me away how our brains get affected by manipulation. How is it that this dear writer is so confused about such basic differences between something illegal ( striking another person) and her husband’s very vague definition of ‘feeling disrespected’. I say this not in judgment at all because it took years of Bible Study to begin seeingt the truth about my own marriage as well as the way my FOO operates. Just keep taking steps toward truth. Read your Bible ( better yet, do so in a safe Bible Study). Pray, pray, pray. Slow things down in your life ( especially conversations with your h and when you feel confused STOP the conversation – this was the mightiest tool I had at the beginning ( listening to my own instincts)). Keep wise counsel ( friends and a good counsellor). Lean into The Lord. He IS Truth. This is excellent! Thank you for posting. I’m pretty sure I watched/listened to the right one, it has some length but my goodness… so well described. This video was spot on!! It did a great job at explaining it in terms I could understand. Thanks for sharing it. Great video that spells it out very well. Thanks for sharing Liz! Thanks Liz…this is a good video that spells things out well. Boundaries regarding raising your voice should be mutual too. He doesn’t get to raise his voice with you, but you must be quiet and gentle mannered. Can’t have the rules both ways. Good point Sunny, often in these deeply disturbing destructive relationships one person makes a bunch of self serving rules. If some one gave me a pen and paper right now I could write a list of the “rules” my abusive spouse insisted upon. Thanks for bringing up this point. Ah…yes….the never ending rules with terrible consequences for the victimized/manipulated/objectified partner who dares to breathe in their presence. Leslie, you can google them and it will bring yo their webpage. Hope you find the perfect dog for you! This guy is not a Christian or a man. No man treats a woman that way. Get you and your children away from him ASAP. He won’t change, you are the strong one for putting up with that treatment. Get out. God does not condone any abuse. Stay strong. God Bless. Thank you for your firm stance Chuck. With a Christian upbringing it makes me angry and sad I was brought up to be so nice. That nice is more important than truth. And now that I know better I have so few words in the moment and so little courage because I am such a beginner at it so my situation drags on. My unspoken but acted on boundaries have decreased the frequency but certainly not changed his heart as it still slips out. I am angry and sad that this woman who is being hit has to question herself if she is doing the right thing when she asks him to stop and he feels this is a negotiating point to get what he wants. Angry and sad that my friend now is stepping into the exact wrong situation of going for couples counselling with a Christian lay counsellor and her EDH will likely get away with years of manipulating the situation even though I have shared with her truths and resources contrary. Why is this so hard to step out of whether the abuse is subtle or overt? I’m looking for that moment when the pain of changing is greater than the pain of staying the same…pain either way. Might it be wise to begin to formulate an exit plan? You can choose to enact it at your discretion. Exit plan guidelines are available on most domestic violence sites and from the national hotline. Oh my gosh, Annie, your question at the end of your January 22 post just begs for an entirely separate blog! Thank you for it. I believe you summed it up well when you said “the pain of changing” (did you mean that the pain of change is less than the pain of it staying the same?). In my own circumstance, my answer(s) would be under that umbrella “pain of changing”: not wanting to let go of the “nice feeling” of being part of a couple (even a volatile couple! )…having to uproot from an already-established home, family, routine (which usually includes friends, family members, church…)…the opposite side of the same coin above: having to deal with the prospect of being single (again) and what that entails. Shoot! I don’t want to add to that pain of change by going into detail here, but by holding onto the pain of the relationship I have hopefully temporarily lost a lot of things anyway due to an injury that has taken time to heal (which includes sometimes what feels like my sanity because of not understanding where his treatment and my behaviors begin and end — what I could do/could have done differently and how much that may or may not have changed my husband’s responses). All of that said is to say if your mind feels tangled and/or you experience even just a modicum of peace more thinking about the change versus thinking about remaining (and I know even THAT can change from moment to moment at times! )…just keep seeking wise counsel and prayer and privately journaling is also an excellent way. I don’t know your specific situation, and this may or may not apply, but things can escalate if certain other things are allowed to continue. God bless. Oh my gosh; this forum is amazing. I am so grateful for it. My husband has physically abused me, but most of the abuse that occurs in our little family has been verbal – often mutual, sadly. I take part of the blame because I know my motivations for marrying were not godly (even though I am a Christian), and that guilt has permeated the entire length of time – before and after the marriage – the relationship. This deeply frustrates and hurts my now-husband, which touches raw nerves of rejection and insecurity, which leads to what I believe are deeply ingrained responses of name calling, sarcasm, and mocking. These responses, in turn, only serve to convince me that I am reaping what I have sown by marrying (though deep down inside I know it is wrong), and to often give back responses that only serve to make him more hurt, more frustrated, more angry at me. This has been the impetus I think for some of the physical. But what was shared here is all-too-familiar. My husband knows ultimately that how he treats me is not right; but I guess in order to avoid the reality that this is really part of him(? )(ONLY part; he has some very wonderful, wonderful qualities that drew me to him), or…I’m not sure…quite often it comes back to that it is me who “pushes buttons” (I have even been told that by my congregation) and that I need to change (and to this day, I am very hazy on what that change is supposed to be; I hear the word “you” so often and I can almost FEEL the word when it is said now). I WANT to change to be a supportive; encouraging; and yes submissive wife, but when I even ask that question (about how I can change), I am told things close to that I should know what that is (though at other times I am told that I am not equipped to “diagnose” my own issues)…and even that I have deep spiritual strongholds from which I need to be delivered. All of this makes my mind feel twisted and my heart feel sad as I often feel like I will never be able to be that which my husband desires me to be. We are separated, and I don’t THINK I want the marriage to end; but I also sadly can’t see myself living under the conditions described above. I am so torn right now about wanting to go back to my little family (and congregation, which I love), but knowing what happened most recently between my husband and me can’t happen again, along with all of the abuse that led up to it. I have been seeking counsel (now including this marvelous site); but my husband, though he says he knows he/we need counseling, has not been that hungrily seeking it (as much as he says he wants our marriage to work) and often comes back to both referring to my problems in the marriage and that we should be able for the most part to work it out together. I wish I could believe that; but wisdom and love says otherwise. I hope that’s what it is. Thanks and God bless. He is not fit to diagnose your issues either. Have you read Lundy Bancroft’s books yet? So what that you married him for the wrong reasons. None of us really know what marriage is until we are in it. Many people selected mates across the centuries for poor reasons. Time to live in the present. Clean up your act an hold your tongue. Record his abusive words and set boundaries. He does not get the right or have the authority to criticize you. You are a child of God who Christ died for. Be loving even if you are not being loved. Then his bad behaviors will be more obvious. Don’t engage in argument or conflict. Get individual counseling for yourself. Read, listen, learn and pray. Then you will know what action to take. Watch Patrick Doyle’s videos and call domestic violence hotlines for more information. I desire to honor the Lord in what I say here. The entrapment which comes from being in an abusive marriage relationship, sometimes, does not stem from how we treat our own spouse. It has a lot to do with how each of us were raised. It depends upon who our parents were, how they treated each other, how they treated their children (us) what type of fellowship we had in church growing up, including abusive relational values which were very strict, or on the other hand, very lenient. If our parents showed love to one another, whether there was violence, or there was a mutual respect for each other. The way we were raised does have a profound affect on how we perceive our own marriages. I have read Leslie’s book ‘The Emotionally Destructive Marriage.’ I have Lundy Bancroft’s book ‘Why Does He Do That?’; I have read Cloud and Townswend’s book, ‘Boundaries’. I have been on at least four counseling sites online, on Facebook, and have read countless sites about Narcissism, Scociopaths, etc. in order to be well armed with facing my own marriage dilemma. I have been blessed beyond measure from the arsenal of beautiful counsel, which has enabled me to be strong in the Lord. I completely understand about what Aly went through with her husband. There are men, no matter how strong and loving and kind the wife is to the man, that the husband feels entitled to whatever goes through his immature imagination. This type of man is spiritually stunted. My husband just recently told me that he does not know how to change. At least he admitted it. For years, all I could think about was, what am I doing wrong to deserve the verbal, emotional, and mental abuse, and once, I was hit for a very minor thing. This was twenty years ago, before there was the computer to turn to for advice and council, with all of the domestic violence information. It was a time when the church was NOT coming to the aid of women and some men, who were in abusive relationships.I know this to be true, as I had gone to one of the minister’s wives, and had told her part of my marriage plight, and she had told her husband, and the next Sunday, the minister came up and his short, one line sentence, he said ‘The ball’s in your court now.” No help, no council, no nothing. At the time, I had even confronted my husband with his abusive, and all he said was talking about his family’s FOO, repulsed him.His dad was a man of severe verbal and physical abuse. My husband did not want to address why he was the way he was. Just like his dad. His words were, “I am not like my dad.” His own sister one time confided in me that her brother (my husband) was far worse than his dad ever was.. It showed to me that my husband was a very damaged individual, with not a lot of hope in him ever changing. When he had first sat down for lunch he could have chosen to wait for ME to sit down so we could eat together. But, no, that type of thinking does not cross the mind of a man who feels everything revolves around himself. That is how our marriage has been. Mostly about how it has been about him, and his entitlement. Now, why I am saying this is, as a wife, we can worry about the little things which will annoy our husbands, which is circular reasoning which gets us nowhere on the road to recovery of our own healing. We have to let go of the angst of our husbands, and let God do the work in the husband’s heart. As much as we would like for our husband to change, it is not going to happen, if we allow ourselves to be trampled time and time again, without just letting it go, and moving forward with our own lives for the Lord. If we are thinking too much of what our husband’s next reaction is going to be; our minds are preoccupied with how we can answer our husband’s next verbal assault; which is ends in over-thinking the problem. This is unhealthy, and does not allow the Holy Spirit to reign in our hearts. What we should be doing, is thinking more of what the Lord wants us to be doing with our situation, and work on building ourselves up in the most holy faith, and in God’s Word daily. And for some, this means planning for a way of escape, in God’s timing for us. And so I ask a simple question: why are you preparing him food, at all? When you open yourself up like that you are opening yourself up to be ‘trampled on’. You are a daughter of the most high king. When you accepted Christ your very nature changed (John 1:12-13), you are no longer a prisoner of generational sin, or of your FOO.